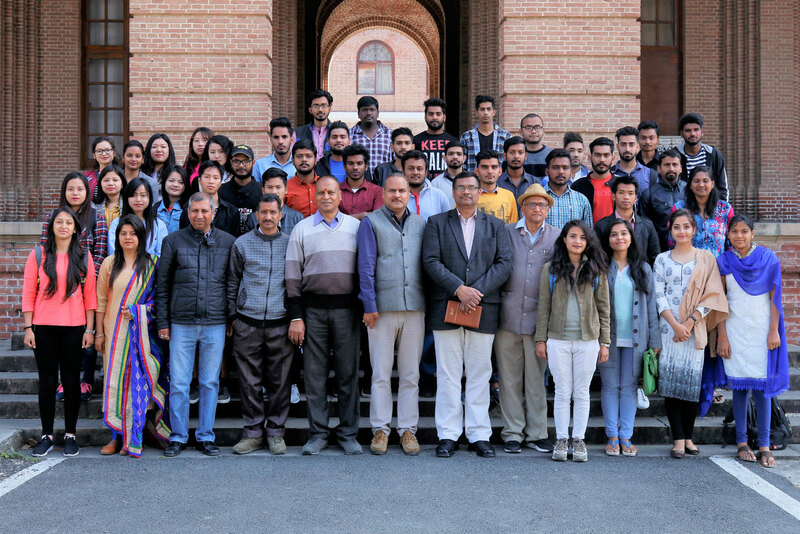 Extension Division, Forest Research Institute, Dehradun has organized two exposure visits for B.Sc. Agriculture/Horticulture students of BFIT, Dolphine, Shivalik, Alpine Institutes, Dehradun at Forest Research Institute, Dehradun on 22 and 23rd February 2018 who were under training in Baagwaan Gramoyudyog Samiti, Dehradun for a week. The students came to FRI for training hailed from different Indian states like Arunachal Pradesh, West Bengal, Nagaland, Jammu and Kashmir, Haryana, Uttar Pradesh, Punjab, Andhra Pradesh, West Bengal, Jharkhand, Uttarakhand. One students was also from Nepal. About 80 students visited FRI on exposure visit. Dr. Ashok Kumar Pandey, Head, Extension Division, FRI presented a general view of the institute which includes mandate, major areas of research and achievements. He gave a brief account on NTFPs including medicinal and aromatic plants. He told that by cultivating medicinal plants, livelihood opportunities can be generated for the farmers of the area. He also emphasised to the need of adoption of recent scientific techniques in agriculture sector. Dr. Amit Pandey, Head, Forest Pathology Division, gave a brief account on forest diseases and cultivation of mushrooms. He said that cultivation of mushroom can provide an opportunity for the rural masses including women. Dr. Charan Singh, Scientist of Extension Division delivered a talk on Agroforestry and livelihood improvement. After the completion of above lectures trainees visited different FRI museums and forest nurseries. An visit to NWFP Nursery was also organized for the trainees. The programme was anchored by Dr. Devendra Kumar, Scientist D, Extension Division, FRI. Mr. Rambir Singh, Scientist D, FRI, Mr. Vijay Kumar, ACF, FRI , Mr. Ajay Gulati, STO, Mr. Sachin Kumar, Mr. Maneesh Kumar and other team members were present to make successful the programme.